Recently I’ve read Ellen’s books, Tina Fey’s Bossypants and the Judy Greer book I Don’t Know Where You Know Me From. 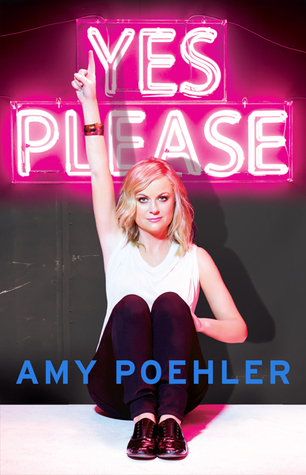 I was a little unsure of this one because I don’t know Amy Poehler except from Baby Mama and the more famous SNL skits but I loved this book. I’d actually recommend this one above any of the others. I think sometimes it just comes down to what’s relatable for me. I found her immensely relatable and very likable. Perhaps it’s no surprise she’s also a great storyteller and moves quickly through her childhood and her early improvising days. I loved her little asides on how hard apologies are to make and how she’d rather just run and hide from them which only makes it worse in the long run (totally my MO and I never learn.) I also appreciated her writing about how she’s learned to stand up for herself and when to just let things go. Most importantly there’s some great SNL stuff in here. I respect the fact and understand that people don’t want to dish and gossip about people they probably will work with again but Amy gives you a lot of great memories and tidbits about her time on SNL and Parks and Recreation. I loved it. I love behind the scenes stuff. I don’t need the dirt when you can hear about the good times and what really comes through is how much she respects her colleagues and the work. I loved reading about her friendship with Seth Myers and the times they almost meet before actually meeting. There are some laugh out loud parts, mostly at her own expense. Plus there are some lovely moments with her sons and she ends on a trip to Haiti amidst all the madness of preparing to host the Golden Globes. I was left with the impression of a very talented woman who worked very hard to get where she is and is almost completely comfortable in her own skin. One that also recognizes she got incredibly lucky. I was left with the impression that if I meet her in real life I’d totally like her. The only tiny little thing about this book that bugged was how much she whines about how hard it is to write a book. If you aren’t a fan you probably aren’t going to bother with this book anyway but that aside I’d recommend this one to anyone even if they just want an enjoyable read and a quick laugh.